This photo shows the difference between the Dark Sage and Red Pepper and the Tweed Green and Cinder versions of Magic Carpet. This is the listing for the 2' Version of Magic Carpet with a small frame!! These hand-painted Barn Quilts are very rustic and will look awesome hanging outside on a house or garage or used as inside wall decor as well! Available in many patterns and colors, this particular pattern is Magic Carpet and there are four different color versions. They are as pictured.... 1) Dark Sage and Red Pepper, 2) Tweed Green and Cinder; 3) Dark Sage and Tweed Green versions side by side; 4) Pewter and Cinder; 5) Dark Sage and Dusted Purple. Other colors are available by special request. Upon purchase, please note color version in the message to seller section. *** Special note that all of my quilts are on a MADE TO ORDER basis. If one is available for immediate shipment, it will be noted at the top of the listing. Also note all of my quilts have a painted black border IN ADDITION to the black frame. It's my signature look. 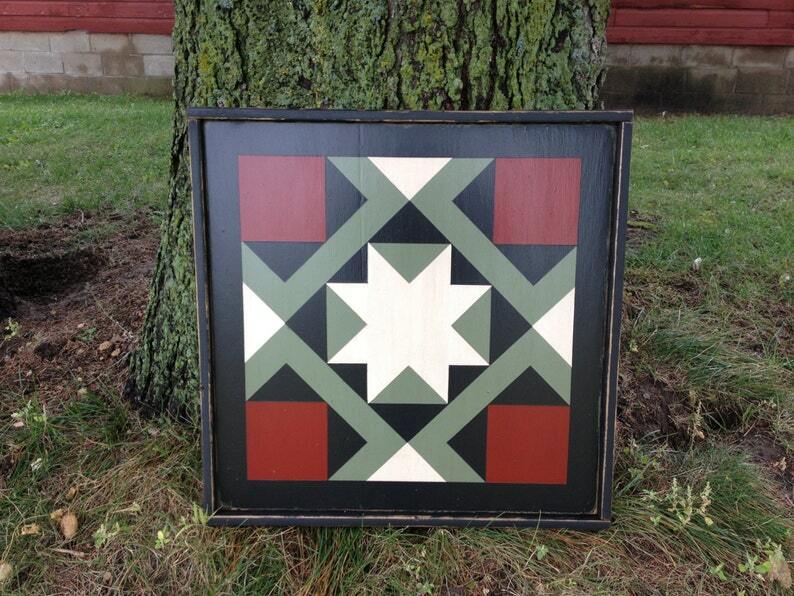 Not all of the quilts pictured have the exact frame style for that listing. Refer to the last picture on the listing for a close-up of the frame and black border. The width of border is determined by the pattern and size of the quilt, but is usually between 1 1/2" to 3" in width. All of my quilts are hand-painted on 1/2" plywood, using premium Exterior paints with primer, then are distressed and stained to achieve that aged look. They are finished with Satin finish Exterior Urethane. The 2' quilts have a 3/4" edge frame attached to the edges of the quilt. (See last photo for close-up example of frame style) The finished size is roughly 25 1/2" x 25 1/2". The 23 version of this quilt is available in a separate listing. Don't forget to specify which photo and color combination in comments section upon ordering. Please message me if you have color questions prior to ordering. Unless otherwise specified by customer, new orders will be painted in the colors shown in first preview photo. Many other color combinations are available upon special request.